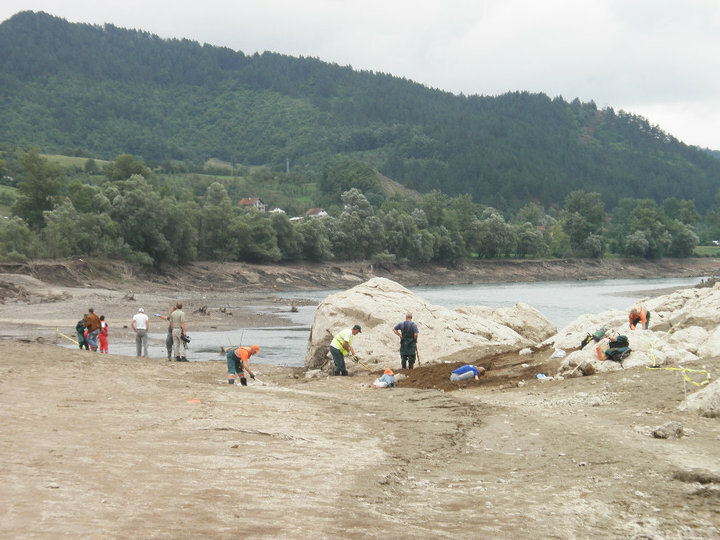 Ines R. from Visegrad sent us a couple of pictures she took at the on-going exhumations on the Drina river banks. Some 3,000 Bosnian Muslims were murdered during the Visegrad Genocide. Around 800 Bosnian Muslims are missing. Image: Remains of Visegrad victims on the Drina river banks. Image: Remains of Visegrad victims found on the Drine river banks. Image: Remains of Visegad victims found on the Drina river banks. LAKE PERUCAC, Bosnia-Herzegovina — It’s a grim legacy of the Balkan wars: Dozens of skeletons exposed after a manmade lake was partially drained for maintenance. 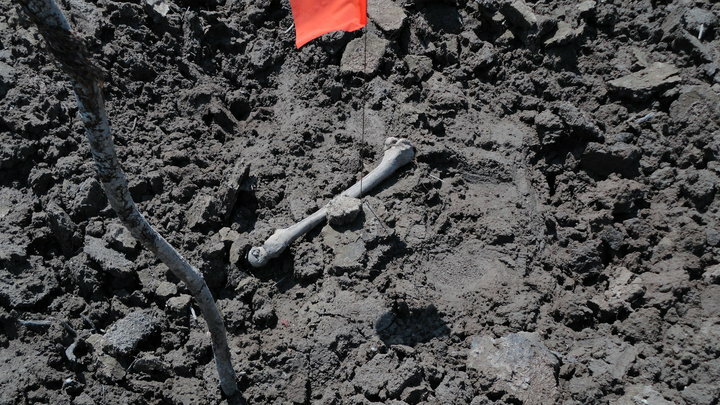 On Wednesday, shovel wielding volunteers joined forensic experts searching for more remains of Bosnian war victims on the muddy banks of Lake Perucac in eastern Bosnia. The search began a month ago after the water level was lowered for dam work, exposing a quarry of human skulls and bones — the remains of people killed at the start of the 1992-1995 war and thrown into the Drina river, which divides Serbia and Bosnia. The find prompted forensic experts to appeal for volunteers to help and they have so far pieced together 73 full skeletons. Amor Masovic, the head of the Bosnian Institute for Missing Persons, said that in the nearby town of Visegrad, 824 Bosniaks — Bosnian Muslims — were killed by Serbs at the start of the war. The conflict pitted Bosniaks, Serbs and Croat ethnic groups against each other in battles for control of Bosnia after it split from Yugoslavia. Most were then thrown from a bridge and their bodies got lodged in the banks of the artificial lake, a dammed section of the Drina, a few kilometers (miles) downstream. “We expect Serbia to provide an answer to what happened to those bodies,” he said. The servicing of the Serbian dam will last until mid-September when the water level will start rising again. But with the help from about 100 volunteers, Masovic said his team will be able to inspect the 72 miles (116 kilometers) of shore line. Some 50 public employees from Sarajevo — transit, landscaping and mortuary workers — have volunteered to help for the past 10 days, traveling five hours back and forth every day. On Wednesday they were joined by another 46 people who responded to an appeal nailed on the gates of mosques in Sarajevo. Armed with shovels and other tools, the volunteers braved the heat, dust and the strict fasting rules of the holy month Ramadan. No food, no water until the sun sets. Landscaper Sabit Besirevic, 40, was born and grew up in Visegrad. He fled when Serb forces occupied the town in 1992 but his parents stayed behind. Besirevic was particularly gentle while excavating. In northeastern Bosnia, nestled in the Dinaric Alps on the border with Serbia, there lies a small lake. Formed in the 1960s, when the Drina was dammed to build a hydroelectric power station, Lake Perucac seems unremarkable – just one of many artificial lakes in a mountainous region whose hydroelectric power is a major economic asset. Its significance, though, lies in its location downstream of Visegrad, the small eastern Bosnian village most famous before the 1990s for itsbeautiful 16th-century Ottoman bridge. Since then, though, it has developed a far more macabre reputation, second only to Srebrenica as a byword for ethnic cleansing and for humanity at its cruellest. Three thousand Bosniak Muslims were killed here in the spring of 1992; not in one organised operation, as in Srebrenica, but over weeks and months, killed almost for sport by the police and the army. Their bodies were dropped from the famous bridge and into the sparkling blue-green Drina, where the current took them downstream to Perucac. Given the town’s reputation, then, the discovery in the last month of more than 50 bodies – found by investigators who are trawling the lake while it is half-drained for maintenance reasons – comes as little surprise. Nobody expected the search to be fruitless. The surprise, to many outside Bosnia at least, has been to learn how difficult the investigators’ jobs have been. At every level, the investigation has been met with resistance. Shunned by locals in the now wholly Serb town, a wall of silence meets even the simplest inquiries, and sometimes the reception is one of outright hostility. Two weeks ago, an unknown attacker shot at a forensic team’s boat. Nobody was hurt, but the message was clear: be careful what you look for. The veiled and not-so-veiled threats are just part of a culture of silence that has been the biggest obstacle in Bosnia’s attempts to find justice and settle the historical record. A shadowy network of former and current figures from the government, police and organised crime – the so-called “Preventiva” – protects those who were responsible for some of the worst crimes in the 1992–95 war, and silences those who threaten to speak. Responsible for protecting the former Bosnian Serb leader, Radovan Karadzic, while he was in hiding, the Preventiva has been successful at derailing or disrupting legal proceedings even when its subjects are caught. Testifying is strongly discouraged; witnesses are intimidated, or worse. Whether through fear or through loyalty, few in Visegrad will talk; those who do are often silenced. In war crimes trials witness testimony is essential. 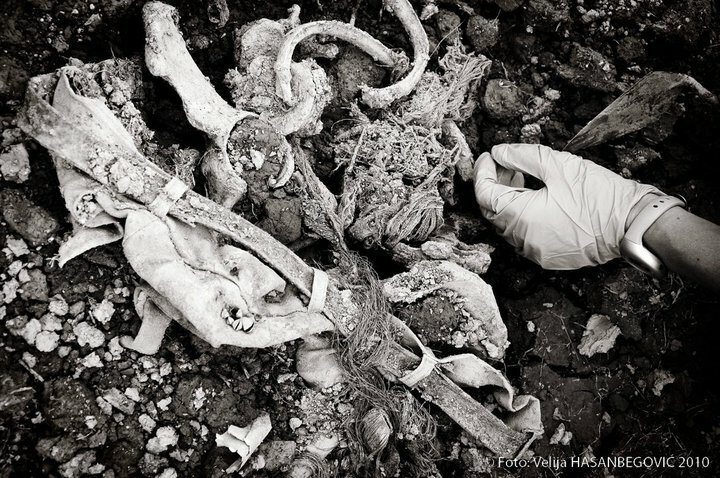 It is typically straightforward to prove that a crime has taken place: there is, distressingly, no shortage of mass graves in Bosnia. But to place an individual or a military unit at the scene, to prove their responsibility, almost always requires witnesses – something of which the Preventiva and their ilk are well aware. In 2005 a former police inspector from Visegrad, Milan Josipovic, testified at the trial of Novo Rajak, a member of the Visegrad police force who had participated in the mistreatment of Bosniak civilians. To testify at all was grounds enough to rile the Preventiva, but when rumours emerged that Josipovic would be prepared to give evidence at a trial of higher-level officials the situation became urgent. Josipovic was shot and killed; his attackers have, unsurprisingly, never been caught. The future, though, is not without hope. Investigators continue to find more material evidence and cracks have appeared in the formerly watertight seal around the Preventiva and its membership. An internal feud is widely believed to have led to the arrest of Milan Lukic, a Preventiva member and the former head of the White Eagles paramilitary organisation that was responsible for some of the worst crimes in Visegrad; last year he was sentenced by the international criminal tribunal for the former Yugoslavia to life imprisonment. It remains to be seen whether the shroud of secrecy will fall completely. If Bosnia is ever to bring to justice those who haunt her past, though, then it surely must. “March on the Drina” is a Serb patriotic song composed by Stanislav Binicki during World War One after the Battle of Cer. This composition was adopted by the Nazi-collaborate Yugoslav Royalist Army popularly known as Chetniks during the Second War War. It was played during attacks on Bosniak towns in Eastern Bosnia during the genocide from 1941-1945. During the Communist rule in Yugoslavia, The March on the Drina was banned since it glorified Serb Nationalism and genocide. A film with the same title produced in 1963 was also banned. In the nineties, during bloody campaigns carried out by Serb armies in the Balkans, this composition was re-introduced especially during the attacks on Bosnian towns bordering Serbia along the Drina River – Zvornik, Bijelina, Visegrad, Foca and so on. and the river Drina’s glory, courage! And the heroic hand of the father and sons! Expelled the invaders from our dear river! By the Drina was freedom! Laibach, a Slovenian industrial band was one of the rare foreign bands to perform in Sarajevo during the siege. At the National Theatre in Sarajevo in November 1995, they performed their interpretation of “March on the River Drina” – a dark, mysterious and horrific interpretation. Update: Read Channel 4 Alex Thomson ‘s article on the Drina exhumations. 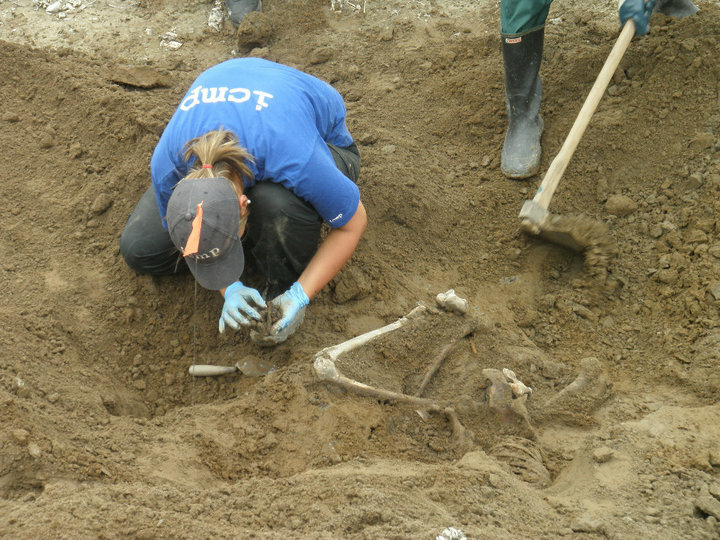 Current exhumations taking place along the Drina river banks have been documented by Visegrad Genocide survivor Velija Hasanbegovic. Velija is a photographer working for Radio Sarajevo. His recent work on the anniversary of the Visegrad Genocide was commended by many. He visited Visegrad a few days ago and documented the exhumations going on. With his permission, we publish some of them. 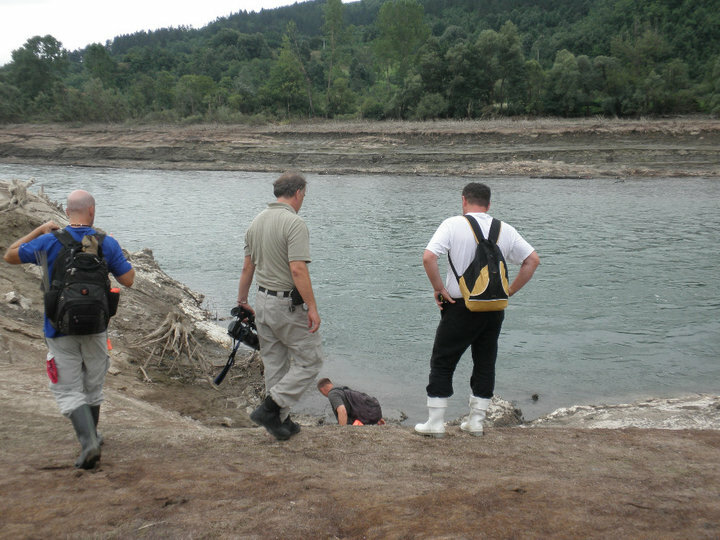 Image: ICMP personel inspecting clothing and bones found on the Drina river banks. 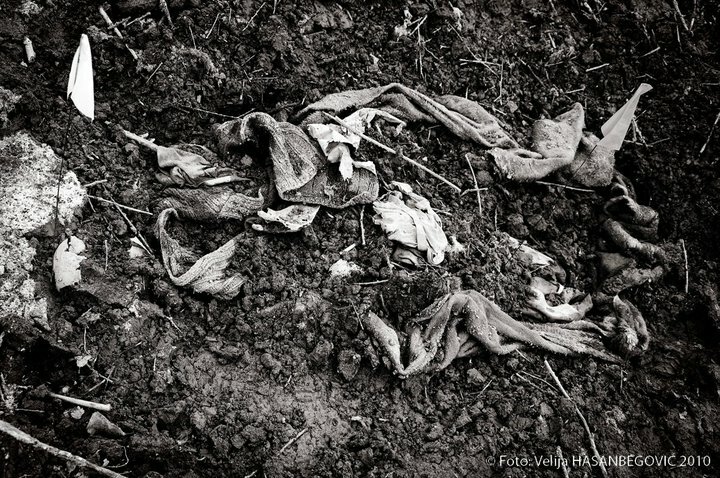 Image: Clothing of a Visegrad genocide victim found on the Drina river banks. 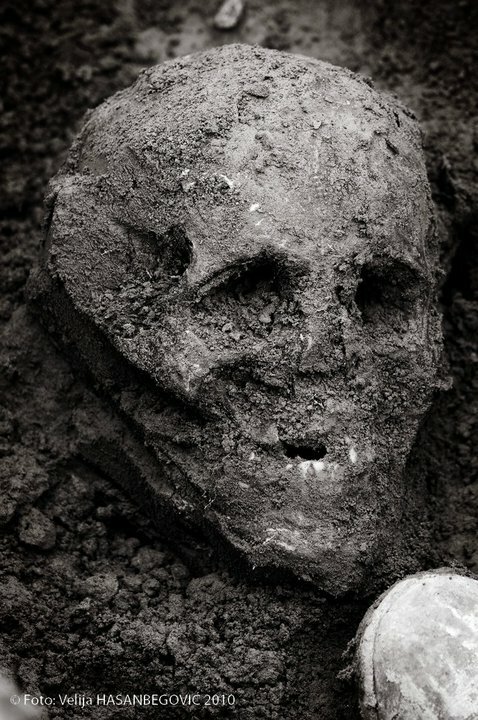 Image: A skull of a Visegrad genocide victim found on the Drina river banks. 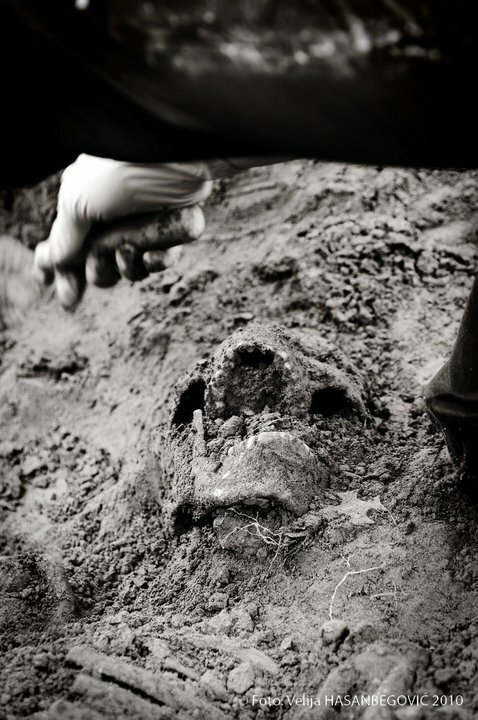 Image: The remains of a Visegrad genocide victim found on the Drina river banks. 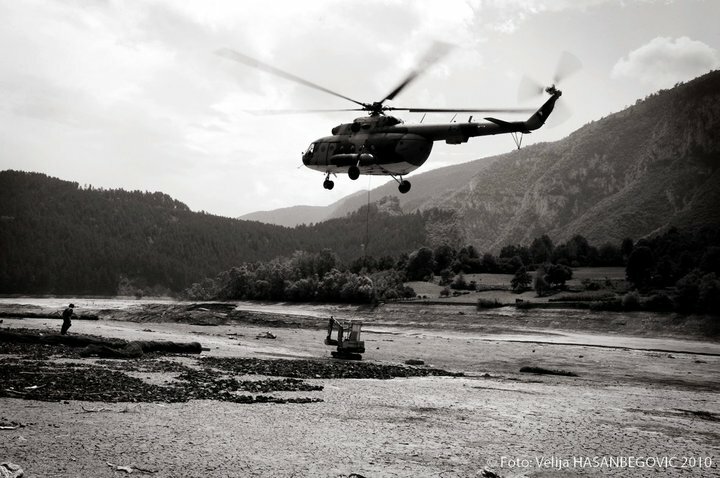 Image: Bosnian Army helicopter brings in machinery to help with the digging. 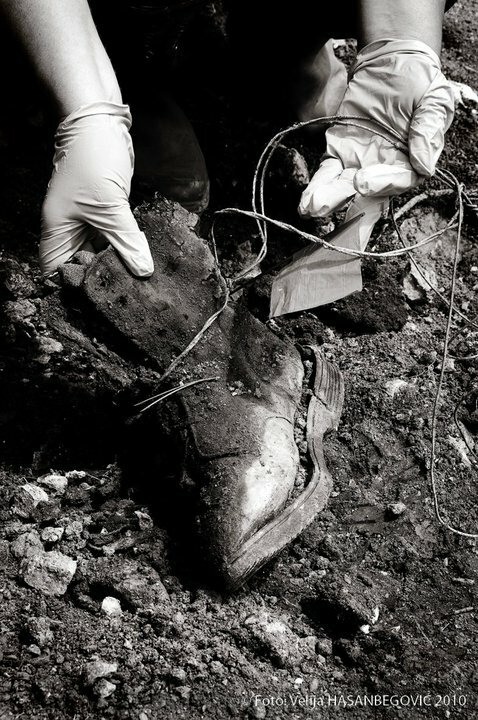 Image: An important finding from the exhumations: a boot with a bone inside it wired. This victim’s feet were wired together and he was most probably thrown into the Drina River alive. 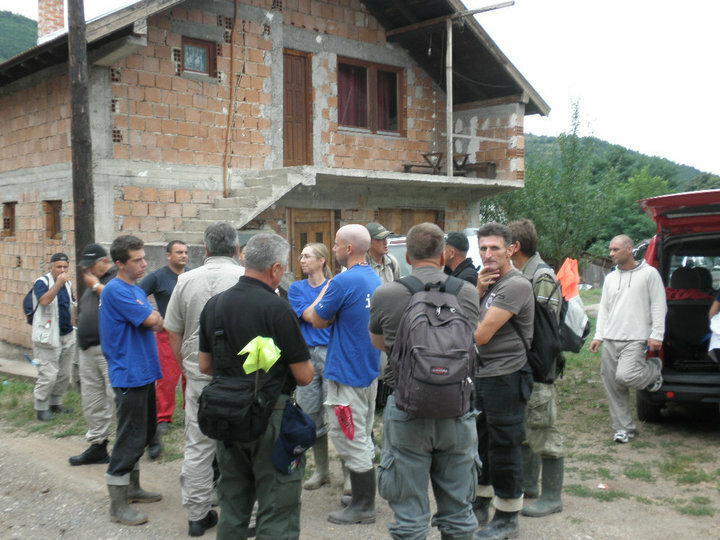 Image: Sarajevo Public workers and investigators receive instructions to start digging. 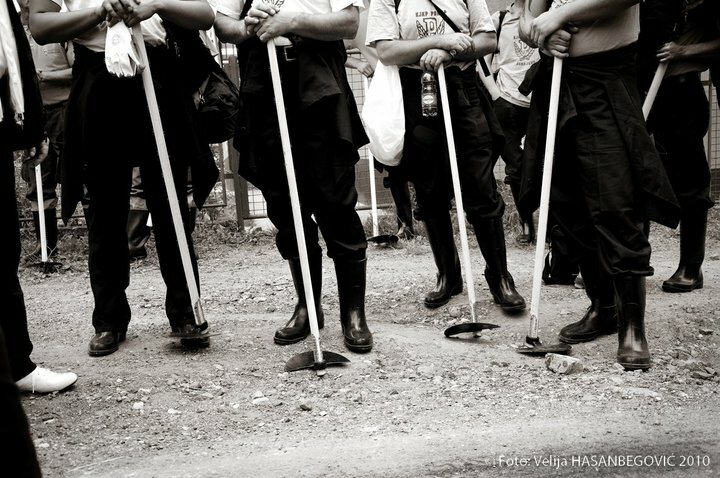 Image: Sarajevo public workers volunteered to help the Missing Persons Institute and ICMP in their efforts. Image: Bones of Visegrad victims surfaced on the Drina River banks. 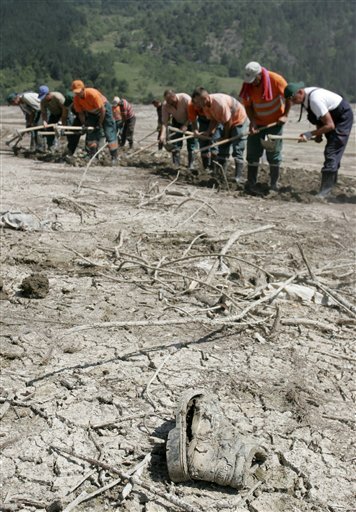 Image: Sarajevo public workers dig through the soil looking for remains of genocide victims from Visegrad. 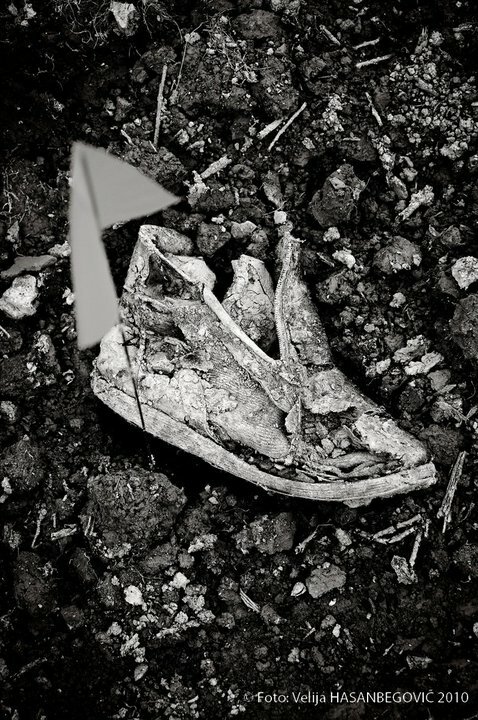 Image: A shoe belonging to a small child – a victim of the genocide – found on the Drina river banks. 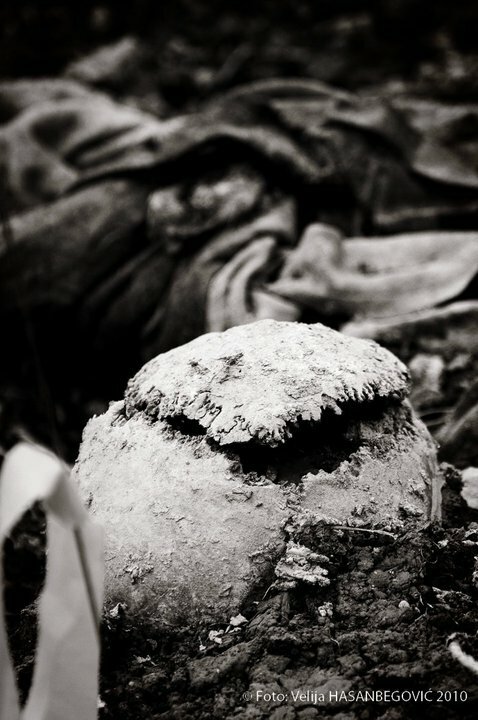 Image: The skull of a Visegrad genocide victim. 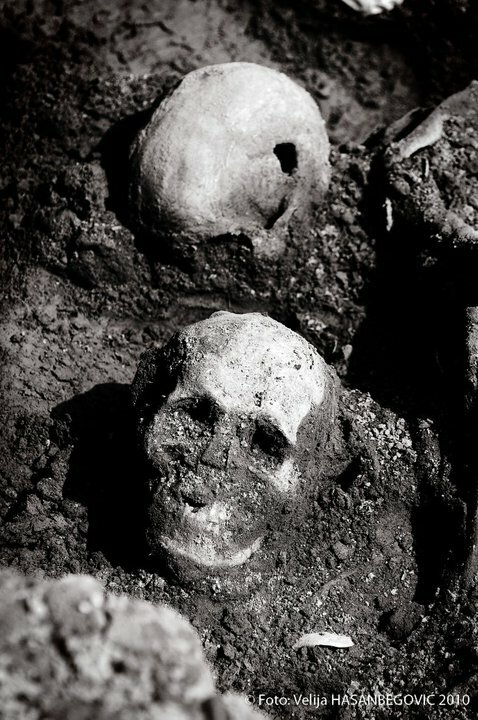 Image: Skulls of Visegrad genocide victims found on the Drina river banks. SARAJEVO, Aug 2 (AP) — Officials say about 50 public employees in Sarajevo will help forensic experts search for the remains of people killed during the 1992-1995 Bosnian war and thrown into the Drina River. 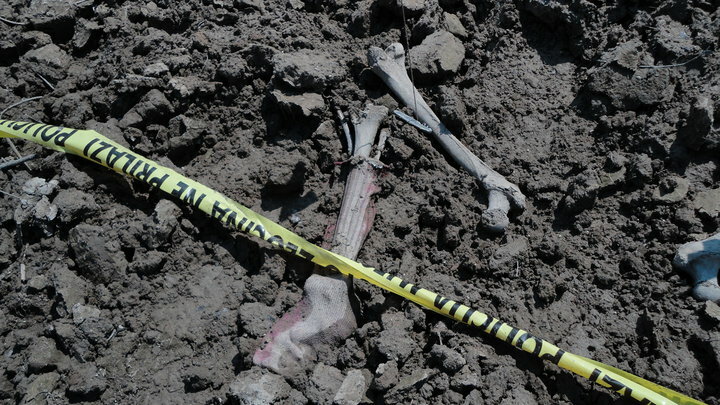 Amor Masovic, the head of the Bosnian Institute for Missing Persons, said Monday that transit landscaping and mortuary workers will help his 12 experts inspect 72 miles (116 kilometres) of muddy lake banks in the next week. That’s when the water level of the Lake Perucac [reservoir] will be low, due to dam maintenance. Over 1,000 Muslim Bosnians disappeared from around the city of Visegrad in 1992 when Serb forces took control of the area. 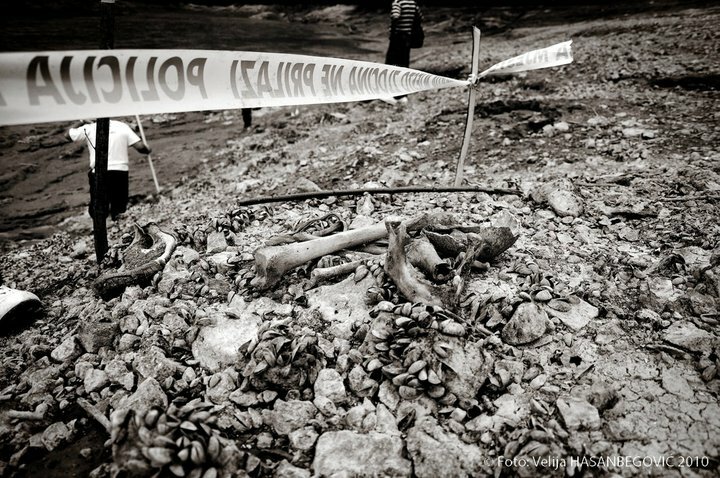 Over a hundred skeletons have already been flushed to the shores of the man-made lake, which is fed by the Drina River. 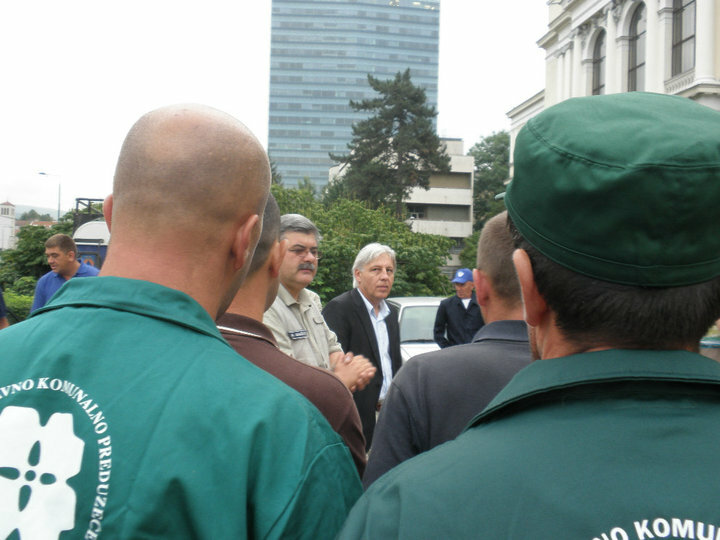 Image: Sarajevo public workers receive instructions from Amor Masovic(Head of Missing Persons Institute) before their trip to Visegrad. 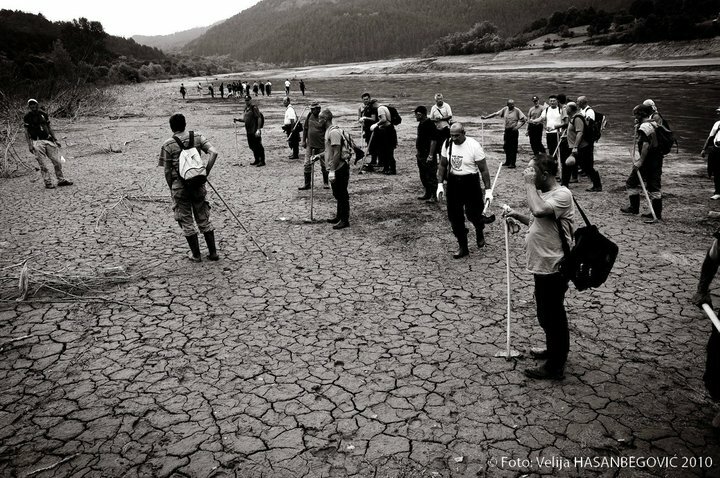 Image: Sarajevo Public workers and war crime investigators prepare to start examining the Drina banks for remains of genocide victims. 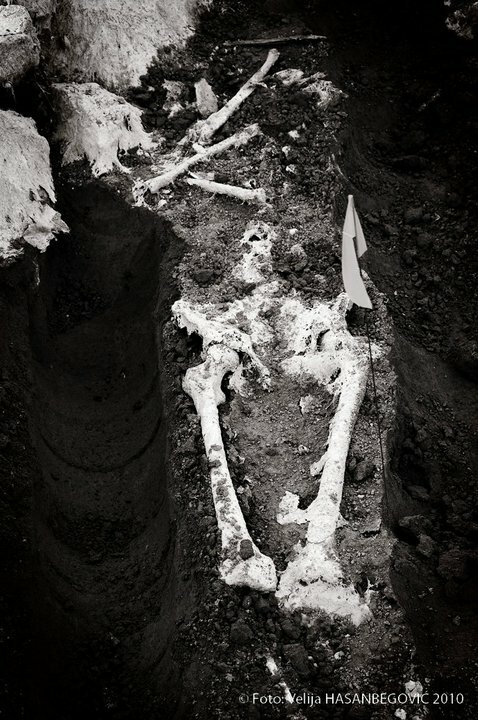 Image: A skeleton surfaces on the Drina river banks. 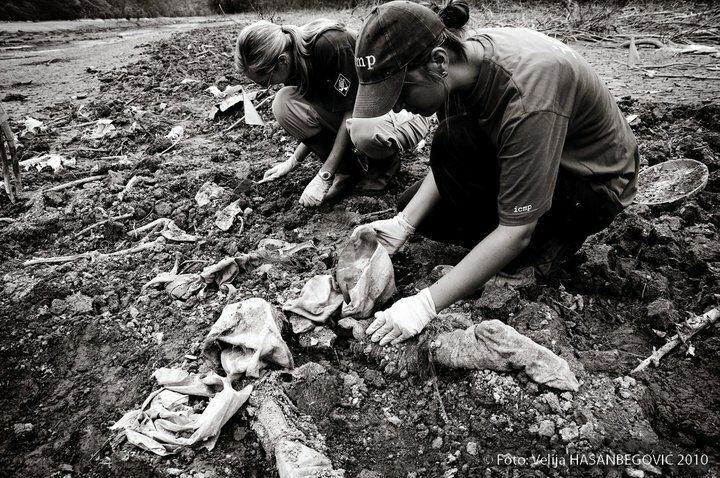 Image: ICMP and Missing Persons Institute investigators examine the remains of a genocide victim. 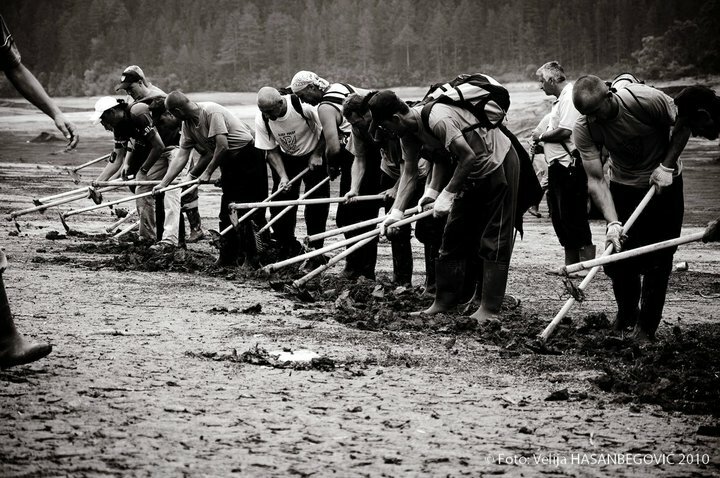 Image: Sarajevo Public workers dig through the Drina river banks looking for remains of genocide victims. 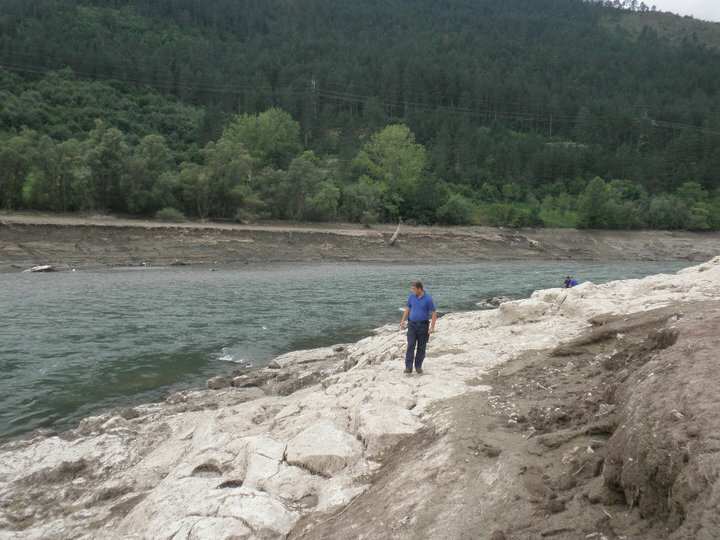 Image: Drina river banks being examined by war crimes investigators. 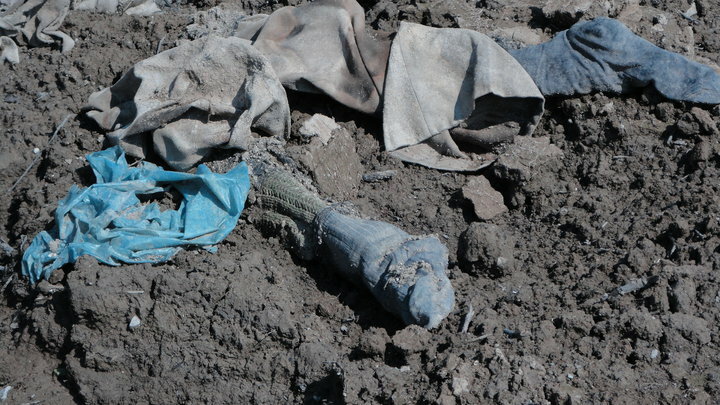 Image: War crimes investigators looking for remains of genocide victims. 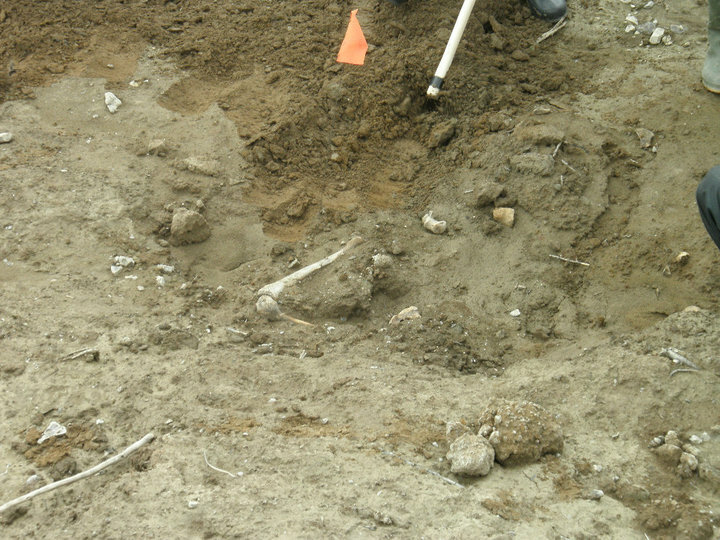 Image: Remains of a genocide victims being exhumed by ICMP personnel. 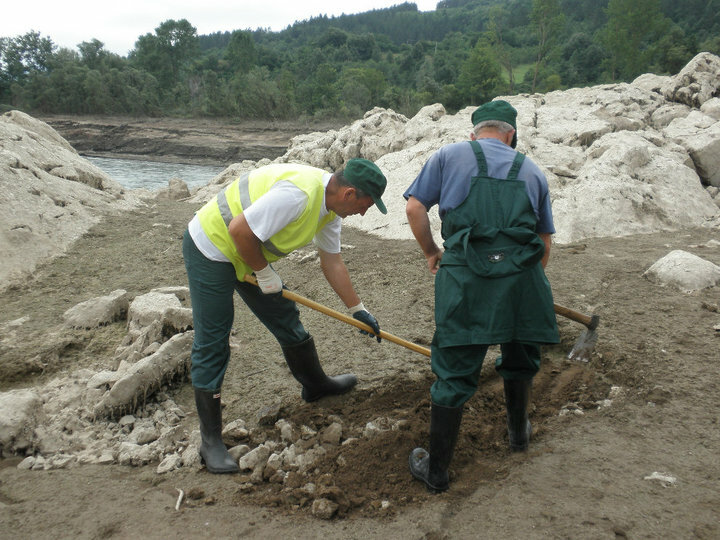 Image: Drina river banks being examined by Sarajevo Public workers, ICMP personnel and Missing Persons Institute personnel. All photos taken in Musici village, Visegrad Municipality and Musicke Stjene, Visegrad Municipality.